Halloween is exactly two weeks away, yet I can't stop gushing over versatile decor that doesn't need to be put away in time for Thanksgiving. 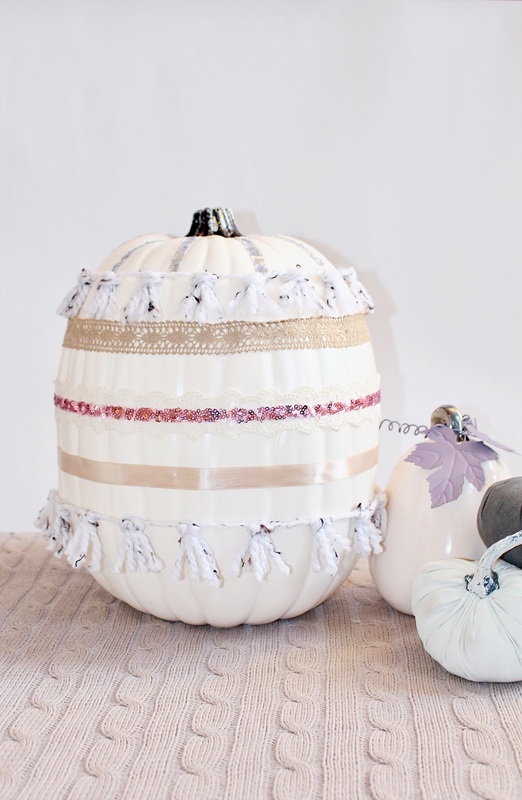 Today I'm sharing a pumpkin DIY so easy & cute that you'll want to keep it indoors to prevent trick-or-treaters from snatching it off your porch. I've always drooled over Moroccan wedding blankets, poufs, benches, etc. 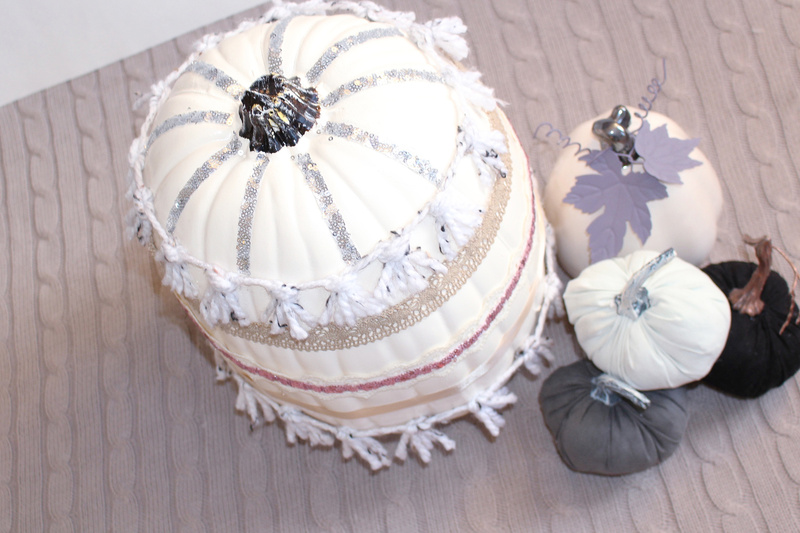 for as long as I could remember, and when I came across Fish & Bull's DIY Moroccan Style Sequin Pumpkin I was inspired to create my own twist. The best part is that most of the materials were scraps I had leftover from previous crafts. *PRO TIP: always be sure to note the length of fabric trim before purchasing in case you need two! 1. 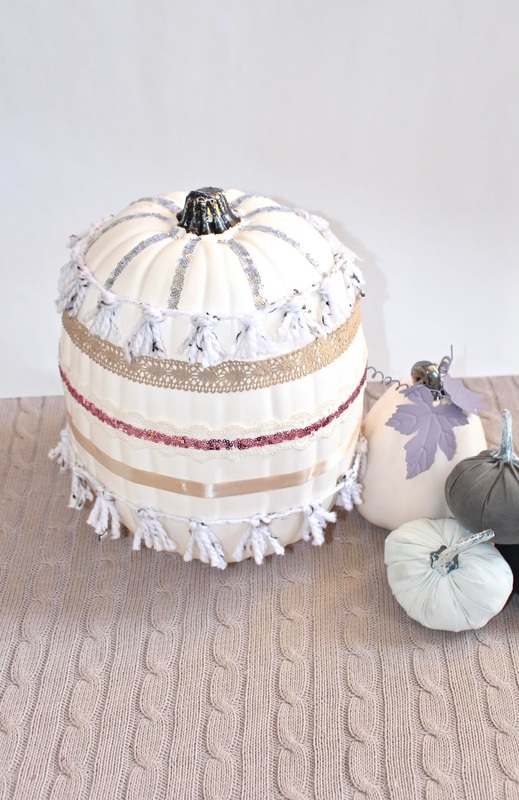 Real pumpkins: wipe down with a damp paper towel to remove dirt and ensure a fresh canvas. 2. Paint your pumpkin white if not white already. You may need 2 coats depending on the quality of the paint. 5. 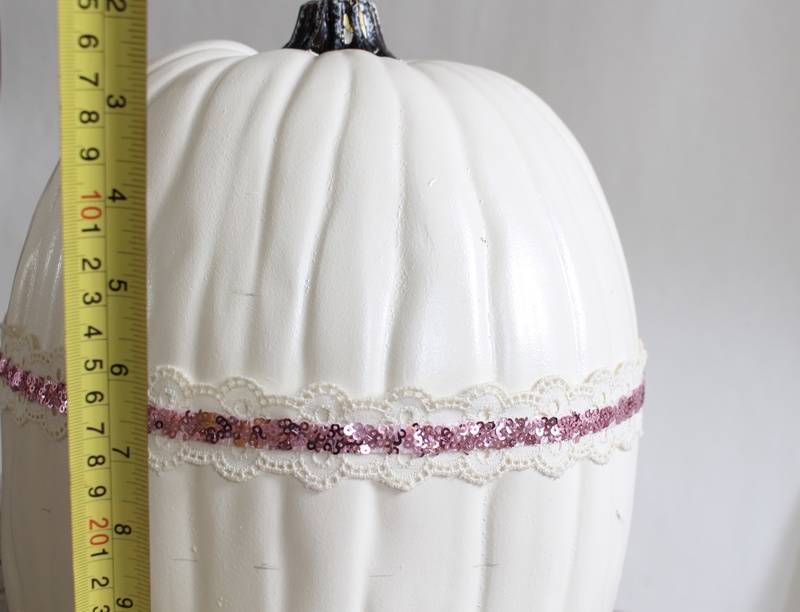 Apply glue to your trim and then place directly onto the surface of the pumpkin. 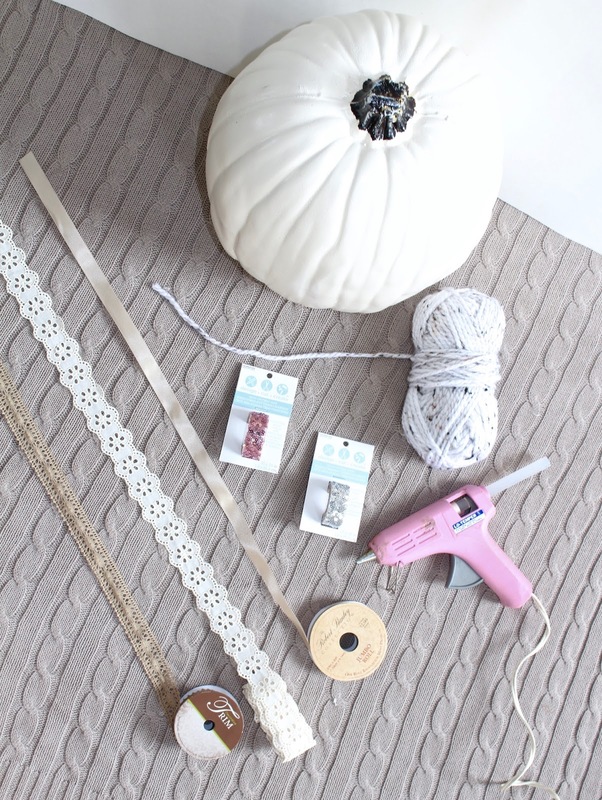 If you're working with hot glue, I found it easiest to use the following glue method: apply a few inches of glue at a time to the trim -> place it on pumpkin; hold in place -> apply glue to next few inches of hanging trim -> place on pumpkin -> repeat until row is finished. This way, you don't need to work at the speed of light before the hot glue dries. 7. If using regular adhesive glue, let dry for up to 1 hour before handling. 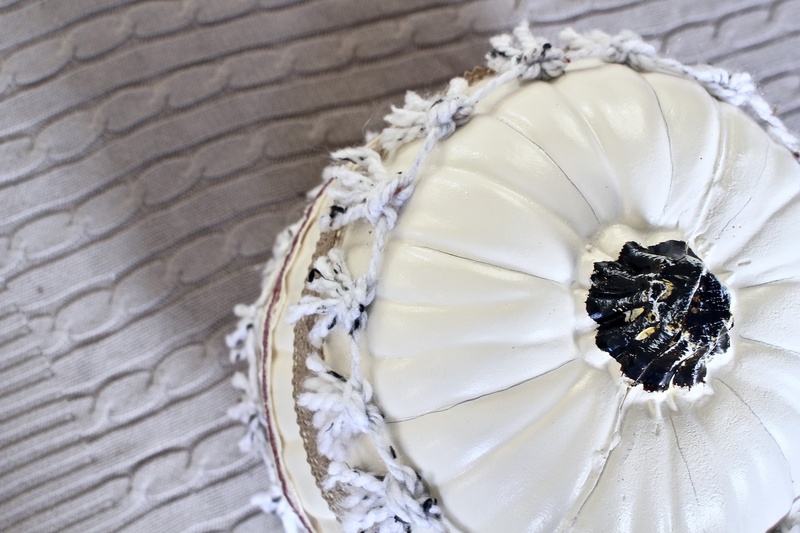 For an optional added touch, paint the pumpkin stem a metallic gold, silver, or any color of your choice. And finally, place this fun pumpkin on display anywhere in your home. This beauty can either stand alone or beside other #basic gourds. Sit back, sip a pumpkin spice latte, & relax while the compliments roll in from your guests! Much love to Anusha from Fish & Bowl for the inspo!